Draft Board record for Michael C. Mihovch filed ca.1941. 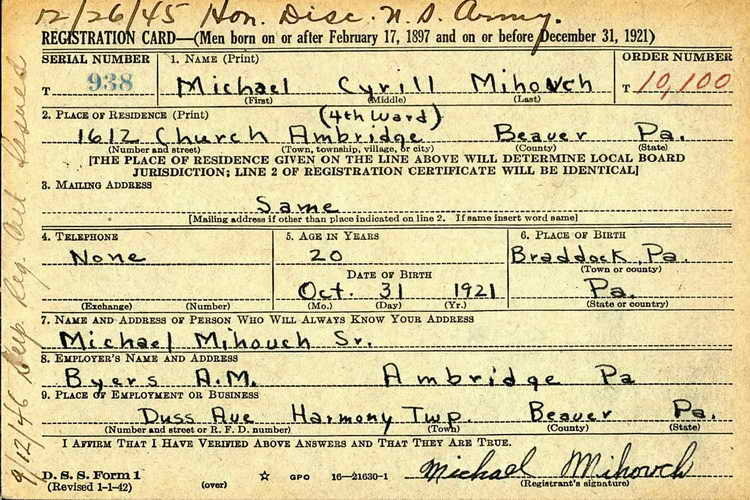 Michael enlisted in the Army at Pittsburgh, PA on 24 June 1942. Pvt Mihovch was assigned to Company SD, 508th PIR. He participated in the jump into Normandy and was wounded in action on 17 June 1944.. Although his name does not appear as MIA in the Morning Reports, he was included on a listing released by the War Department. This headline appeared in the Pittsburg Press on 20 September 1944 with an extract of the 125 Alleghany county men from that list. This two-line excerpt reported Michael. But that news was very out of date as Pvt Mihovch was listed as hospitalized in Company D Morning report of 29 June. One week after this news report, he was transferred from Company D to the Detachment of Patients at an unknown hospital signifying that he was not expected to return to the regiment. He was discharged from the Army on 216 December 1945.